September is No Kid Hungry month. 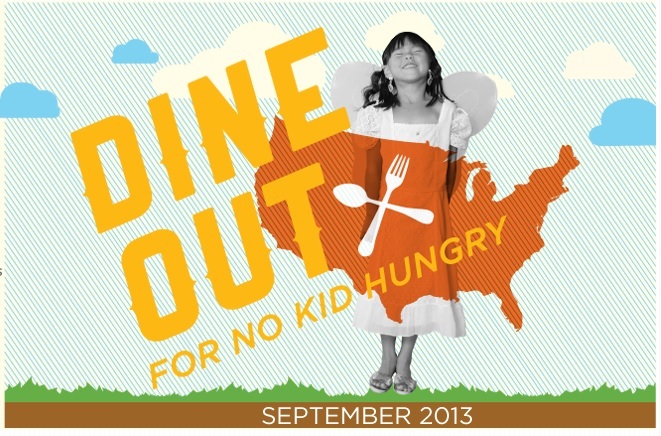 Throughout the month several national and local restaurants are joining the Dine Out for No Kid Hungry program. Everyone can help this worthy program by eating out a participating restaurant. 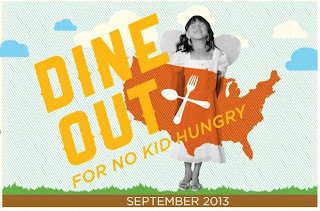 Please visit the Share Our Strength, No Kid Hungry Dine Out page to find a participating restaurant near you. The goal of this year's program is to raise $10 million through various programs. The money they raise benefits the No Kid Hungry campaign and its work connecting kids at risk of hunger with nutritious food and teaching their families how to cook healthy, affordable meals. Other ways to support the cause don't cost a dime. If dining out isn't an option for your family, why not try one of these ways to spread awareness for the cause.